CIA Director nominee Gina Haspel walks to meetings on Capitol Hill in Washington, May 7, 2018. U.S. senators considering President Donald Trump's pick to lead the Central Intelligence Agency, current acting Director Gina Haspel, are divided between those who see involvement in the CIA's past detainee interrogation program as a disqualifying stain on her record and those willing to overlook or move past it. One Republican and dozens of Democrats have declared opposition to Haspel or deep skepticism about her nomination before Wednesday's confirmation hearing at the Senate Intelligence Committee. Opponents have decried the nominee's oversight of a secret CIA facility in Thailand where detainees were subjected to waterboarding and other forms of enhanced interrogation in the years after the September 11, 2001 terrorist attacks on America.Many legal scholars view waterboarding as torture under international law. "I don't think we should have someone in charge of our CIA who was in charge of a torture camp in Thailand," Kentucky Republican Rand Paul said last month on CNN. "I think she's a terrible representative and I will absolutely oppose her nomination." "Torture is disqualifying," Rhode Island Democrat Sheldon Whitehouse said in a statement. "We know Ms. Haspel was a willing participant in one of the darkest episodes of the CIA's history — an episode that degraded our standing in the world, put U.S. captives at greater risk of similar torture, and failed at obtaining significant intelligence gains." The White House has not wavered from full-throated backing for Haspel, even as reports emerged that she offered to withdraw her nomination as controversy over her record grew. Most Senate Republicans and at least two Democrats have signaled they will back Haspel, who, if confirmed, would become the CIA's first female director, culminating a 33-year career with the agency. "I will proudly support her," Majority Whip John Cornyn, a Texas Republican, said. "She is an outstanding nominee." "I know Gina personally and she has the right skill set, experience, and judgment to lead one of our nation's most critical agencies," Intelligence Committee Chairman Richard Burr, a North Carolina Republican, said in a statement. "I'm proud of her work." Haspel met privately with Intelligence Committee members ahead of the confirmation hearing and reportedly told senators that the CIA should not be involved in interrogating detainees going forward. Several Democrats were not swayed by the assurance. "I believe nominees will say practically anything in the confirmation process," Ron Wyden of Oregon said. "That's not much of a claim to make,"Whitehouse told VOA. "There will be no more waterboarding because it's God-damned illegal." But another Democrat, Florida Senator Bill Nelson, hailed Haspel as a career agency employee with numerous foreign postings under her belt, and suggested her actions 16 years ago should not derail her current nomination. 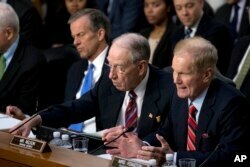 FILE - Sen. Bill Nelson, D-Fla.(R) speaks during joint hearings on Capitol Hill Washington, regarding the use of Facebook data to target American voters in the 2016 election. "That was then and now is now," Nelson recently told reporters. "They [CIA personnel] were operating under the accepted practice of the day." Several senators requested additional information from the CIA on Haspel, who reportedly authored a memo on the destruction of videos showing enhanced interrogation sessions. Democrats have objected to the fact that, as acting director, Haspel has played a key role in deciding which CIA documents pertaining to her own record are provided to the Intelligence Committee. "Ms. Haspel … is in the conflicted position of serving as the classification authority over potentially derogatory information related to her own nomination," Senator Dianne Feinstein of California and three other Intelligence Committee Democrats wrote in a letter to National Intelligence Director Dan Coats. On Monday, the CIA delivered further documentation of Haspel's career to a secure place in the Capitol. "There's been significant additional information released," Republican Senator Susan Collins of Maine said. "I spent considerable time this afternoon reviewing some of that classified information. If there's information that can be released to the public without compromising [U.S. intelligence] sources and methods, obviously I would support that." 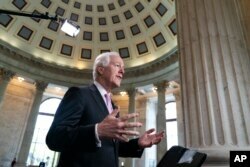 But Cornyn stressed there is a limit to what intelligence entities can divulge. "It's ridiculous to expect somebody who has served their whole professional life in the clandestine service to have a public record that we can talk about in an unclassified setting," the Texas Republican said. If confirmed, Haspel would replace Trump's first pick to lead the CIA, Mike Pompeo, who left the post to head the State Department.